I am very happy and excited to be hosting Fussy and Fancy Challenge #153. My favourite cards to receive have words on the front so I have chosen 'Words.... It's all about the Sentiment' as my theme. 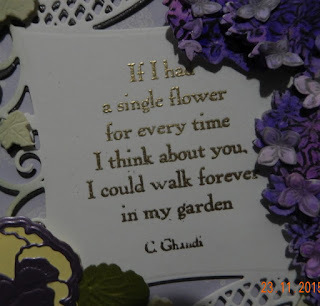 I stamped the sentiment onto this pretty new Spellbinders diecut mat, I also cut a second diecut in charcoal card and slightly offset it to make a shadow. 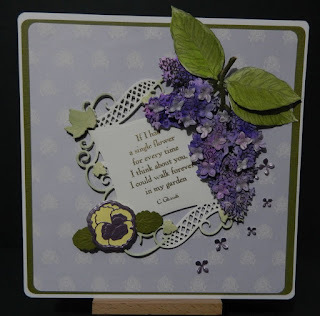 The lilac embellishment was made using Sheena Duncan's Perfect Partners .... stamps and matching dies, I loved decoupaging it up to form a 3d embellishment. The pansy is a new Sue Wilson die. Hope you will join us and enter this challenge, it's very easy you can find more details here . I know everyone is busy preparing for Christmas right now, just take a little time out to create a card, tag, piece of altered art and join in the fun, I look forward to seeing your creations and visiting your blogs. Everyone has an equal chance of winning whatever your skill as the choice is made randomly and I get to choose my top5 .... that is going to be really tough for me. Hi there Annie!! What a GORGEOUS card...your sentiment is highlighted perfectly...AND a PERFECT sentiment it is! I love this theme...and a perfect hostess you will be! Have a wonderful weekend Annie!